The government's worst-case estimate of the total amount of nuclear waste that will be sent to Yucca Mountain in Nevada falls far short of the actual amount of waste that will be dumped at Yucca Mountain based on recent and projected license extensions at the nation's nuclear power reactors. EWG Action Fund analysis of the DOE Yucca EIS, Summary and Appendix A. "Yucca Mountain Statutory Capacity" is capped at 70,000 metric tons. "DOE worst-case waste scenario" assumes that commercial reactors will be relicensed for 10 years each and will produce 105,000 metric tons of waste. This scenario also includes 2,500 metric tons of DOE spent nuclear fuel and 11,500 metric tons of DOE high-level radioactive waste. In addition, DOE estimates that this scenario will include 2,000 cubic meters of Greater-Than-Class-C (GTCC) waste and 4,000 cubic meters of Special-Performance-Assessment- Required (SPAR) waste. "Total waste with full 20-year relicensing" includes 120,000 metric tons of waste generated by commercial reactors assuming customary, 20-year license extensions. The total also includes the DOE spent nuclear fuel, DOE high-level radioactive waste, the GTCC and SPAR waste. The Department of Energy's worst-case waste transport estimate predicts more than 119,000 metric tons of waste will be delivered to Nevada over a 38-year period from 2010 through 2048. This estimate is based on the unrealistic assumption that reactors will receive just 10-year operating extensions, when in fact the average extension for 26 reactors over the past four years has been twice that. 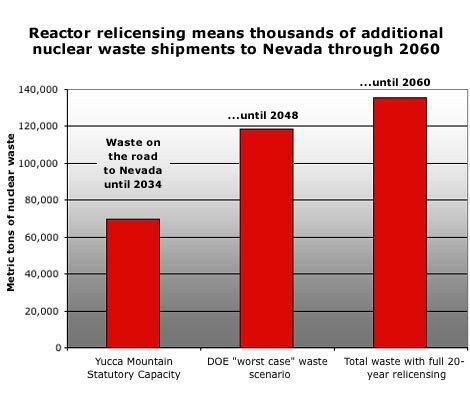 A more realistic estimate based on the 20-year average license extensions being granted, means that at over 18,000 more metric tons of nuclear waste will cross the country to Nevada for disposal than estimated by the DOE. To accommodate all this high-level nuclear waste, Yucca Mountain will have to be expanded, and getting it there, by whatever means, will take decades longer than even the government's longest predictions. Under the DOE's "proposed action" for Yucca Mountain, the DOE would transport 70,000 metric tons of heavy metal (MTHM) of spent nuclear fuel and high-level radioactive waste to the Yucca site over 24 years (2010-2033) (DOE EIS, A-1, J-16; Halstead Testimony 2002). Federal law places a limit of 70,000 MTHM on the amount of waste stored in Yucca Mountain until a second nuclear repository is operational (USCS Nuclear Repository 2004). The 70,000 MTHM would include 63,000 MTHM of spent nuclear fuel from commercial nuclear power plants, 2,333 MTHM of DOE spent nuclear fuel and about 4,667 MTHM of DOE high-level nuclear waste (DOE Yucca EIS, p. S-78). The 63,000-ton estimate represents essentially all of the nuclear waste present at domestic nuclear power plants the day that Yucca is expected to be opened in 2010. In addition, under the proposed action scenario, Yucca would not have room to accept other nuclear waste known as "greater-than-class-C"(GTCC) waste and DOE "Special-Performance Assessment-Required"(SPAR) waste that by federal regulation is generally too radioactive to store near the surface of the earth (Halstead 2002, Yucca EIS, A-1). All of the projected GTCC and SPAR wastes would still be stored at 63 commercial sites and four DOE sites in 32 states when Yucca is full in 2034 (Halstead 2002). The DOE estimated that the proposed action would require more than 53,000 truck shipments to Yucca over 24 years or about 2,200 per year. If rail is the primary means of transporting the waste — and DOE has stated that it prefers rail — the proposed action would require more than 10,700 cross-country shipments over 24 years, or about 450 per year (Halstead 2002). DOE's worst-case waste estimate for the nation's nuclear power plants, known as "Module 2," assumes 10-year license extensions at all reactors. This scenario predicts a total of 105,000 metric tons of nuclear waste produced by the nation's power plants by the year 2046. It also assumes that the nation will have to dispose of 2,500 metric tons of DOE spent nuclear fuel, 11,500 metric tons of DOE high-level radioactive waste, 2,000 cubic meters of GTCC waste and 4,000 cubic meters of SPAR waste (DOE Yucca EIS, p. S-78). The DOE's 10-year extensions would leave about 42,000 MTHM of commercial spent nuclear fuel stored at 63 nuclear power plants in 31 states after Yucca reaches its current capacity, plus 167 MTHM of DOE spent nuclear fuel stored at DOE sites in 4 states, and about 6,833 MTHM of DOE high-level waste stored at DOE sites in 3 states, according to DOE's estimate (Halstead 2002). But the NRC is not granting 10-year extensions to commercial reactors as the worst-case scenario assumes. To date, 24 out of 26 reactor operating extensions have been for 20 years. The other two were for 18 and 19 years. If all reactors receive 20-year as opposed to 10-year extensions, the amount of waste generated will increase by over 18,000 metric tons. Those 18,000 metric tons would mean even more cross-country shipments of nuclear waste than are projected for DOE's worst-case scenario. In that worst-case scenario, based on 10-year license extensions, transporting our nuclear waste would require about 108,900 truck shipments over 38 years, or about 2,870 per year. If rail is the primary means of transporting the waste, the 10-year license extension scenario would require more than 22,000 cross-country rail shipments, or about 580 per year (Halstead 2002). The rail transport scenario does not include barge and heavy haul truck shipments from 24 nuclear reactors that lack rail access. Thousands of such shipments would be required under either the proposed action or the expanded scenario. In addition, the DOE analysis does not include the heavy haul truck shipments required within Nevada if there is no rail spur to connect to Yucca Mountain. Almost 10,000 additional shipments would be required under the proposed action and close to 19,000 such shipments would be required under the expanded scenario (Halstead 2002). DOE has stated that under the worst-case scenario, "[t]he present 70,000-MTHM limit on waste at the Yucca Mountain Repository could have to be addressed either by legislation or by opening a second licensed repository" (Yucca EIS, A-1). U.S. Department of Energy (DOE Yucca EIS Table A-7). 2002. Final Environmental Impact Statement for a Geologic Repository for the Disposal of Spent Nuclear Fuel and High-Level Radioactive Waste at Yucca Mountain, Nye County, Nevada, Appendix A, Table A-7. February 2002. U.S. Code Service (USCS Nuclear Repository). 2004, 42 USCS ¤ 10134(d) (2004). Testimony of Robert Halstead, Transportation Advisor, Nevada Agency for Nuclear Projects (Halstead Testimony). 2002. Testimony Before U.S. Senate Committee on Energy and Natural Resources, May 22, 2002.